Today, I’m delighted to welcome Elizabeth Gates to Virtual Book Club, my interview series which gives authors the opportunity to pitch their novels to your book club. 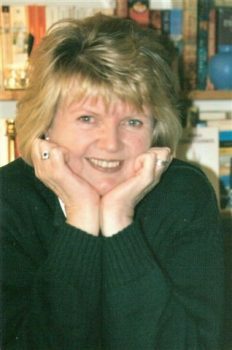 Between reading English Language & Literature at Bedford College, University of London, and acquiring an MA in Linguistics at the University of Essex, Elizabeth explored Europe as a teacher of English and Creative Writing. 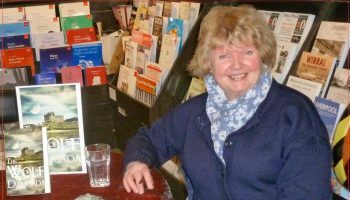 Later she worked as a freelance journalist – published for over twenty-five years, in national, regional and local magazines and newspapers, specialising in Public Health issues such as post-traumatic stress disorder in the armed forces and suicide among our farmers and the health of foreign seamen trapped on ships held in British ports. Elizabeth’s return to fiction has resulted in The Wolf of Dalriada Stories. Her debut novel, The Wolf of Dalriada, was published in 2016 and the second in the series, Staining the Soul, will come out in 2018. A third and a fourth novel are already in the planning stage. Apart from writing, history and travel, she loves family, friends and labradors. Q: Have you always felt driven to write or was there a particular trigger? Writing is like breathing, for me. It’s not just a love of language. It’s a way of life, a way of viewing things – so much so that, growing up, I was surprised to find that other people didn’t want to write. When I discovered this, for a while I stopped saying I wanted to write. To say you wanted to be a writer at that time was almost like coming out at an Alcoholics Anonymous meeting. It was a shaming secret. I then met other writers and felt less of a freak. So yes, I’ve always been driven to write. Q: ‘Notice how many of the Olympic athletes effusively thanked their mothers for their success? “She drove me to my practice at four in the morning,” etc. Writing is not figure skating or skiing. Your mother will not make you a writer. My advice to any young person who wants to write is: leave home.’ – Paul Theroux. I did eventually – although I did write my first novel (about the Napoleonic Greek wars) instead of working for my Science ‘O’-levels. My mother supported me in that she gave my manuscript to the GP to read. His verdict: ‘She’s not mad. Just very, very creative!’ Not sure where that leaves me with relation to your question. On the 10th December 1985, I was contacted by a local theatre which wanted to put on a play I’d written about Judge Jefferys and, that very same day, an editor rang to say she wanted to publish an article I’d written on Dyslexia. Because life had become economically challenging at that point, I had to go with journalism – which I did for twenty-five years. However, nothing is wasted and my experience of writing about a 17th Century lawyer stood me in good stead for my return to historical fiction, decades later. Q: Which brings me very neatly to your novel, The Wolf of Dalriada. The 18th Century seems ripe for picking, but what is it that fascinates you about that era? !n 1793, the year in which The Wolf of Dalriada is set, the civilised world of Europe was awash with new ideas of social justice and social management. Some of these were good, and some bad, but old ideas – also some good and some bad – were hard to eradicate. In the midst of this kind of maelstrom, as ever, most people want to achieve ordinary human ambitions such as falling in love and living happily ever after. After all, even if you are bringing about the death of kings, you still need lunch. But everything at the time and in those places – post-Jacobite Scotland and Revolutionary Paris – was changing. All the old certainties were being challenged. Unthought of earlier, for instance, people were now choosing marrying for romantic reasons – not just for political alliance or commercial gain or personal aggrandisement – and the social consequences of this were tremendous. And there are of course so many stories to be told here. I also find it fascinating the way human beings can work simultaneously with both basic impulses and grand ideas. The Wolf of Dalriada, for example, is a ‘modern man’ in 18th Century terms but he also represents of old Highland ways. In addition, there is also the suspicion that he may be one of the Celtic/Gaelic immortals. Certainly this is how he is seen by his clan. And the heroine, Adelaide de Fontenoy, brought up at Versailles, has to embrace disgrace and poverty and yet survive. The question is: can she? People of any era are endlessly complex and fascinating but I think that the people of the 18th Century were at times tested to destruction. A lesson for us all. Q: One of the interesting things about writing historical fiction is that the reader has the benefit of hindsight, while the characters in the book do not. How do you use this to your advantage in The Wolf of Dalriada? Given the complexity of the times, Characters have to second-guess the future – either to make sure they are on the winning side or to make a stand, while fearing the worst but hoping for the best. This lack of knowledge of what is certain, coupled with what the reader cannot help but know about history, ramps up suspense. Q: Verbal anachronisms have been spotted in Downton Abbey and in Ripper Street. There’s always a difficulty of striking a balance between getting the ‘feel’ of the language of the era right and borrowing directly from the language of the day. How do you go about this? Modern readers have been immersed for decades in period language and their passive knowledge – even if they don’t deploy the words and phrases – will surprise them. However, if only an 18th Scottish Gaelic word or French phrase will do – for information, setting or characterisation – then I feel context should make its meaning clear. If I use a word or phrase which seems anachronistic or too modern, during the edit, I use the Oxford University Press Dictionary to establish its origins and when it entered the language. (Some are surprisingly long-established.) And, if the word or phrase turns out to be inappropriate, I use a thesaurus to find any useful synonyms. Q: The key trick in writing historical fiction is transporting readers to another time and place without overloading them with historical information. So how much detail is too much? Whether it’s in the body of the prose or dialogue, the so-called information dump stands out like a sore thumb. It’s better by far to drip feed contextual details throughout a scene. I favour Hemingway’s view that research should be like an iceberg, only 10% visible. I always research to ensure accuracy but I don’t include everything I’ve learned because I’m not writing an historical academic essay. And I always bear in mind I’m building a world through this information to tell a story. Q: Do you have a technique for keeping track of your fictional canvas and timeline? Writing about characters’ lives against a known historical timeline brings its own subtleties. For example, in The Wolf of Dalriada, the significance of the execution of Marie Antoinette ripples outwards to embrace the Scottish Highlands weeks after the event. But, although she doesn’t know or understand why, the heroine is unable to escape the highlands and take a French ship because of a breakdown in French society which is already happening. In order to keep track of these causes and effects in both the characters’ fictional lives and the historic context of place and time I use the simplest of tools: a spreadsheet. Q: I wonder, did you write about an event from the past that you felt was particularly relevant to the here and now? Or did you perhaps chose to write about an event that has since taken on relevance? By 1793 – the period of The Wolf of Dalriada – Highland society had been largely re-organised in the aftermath of the 1745 Jacobite Rebellion. Pockets of resistance to the new wealth- and status-seeking aristocracy and bourgeoisie still existed but on the whole, the people most affected were disempowered. As one metaphor for this – illustrating clear parallels with today’s society’s changing values – the story of The Wolf of Dalriada explores what female characters must be prepared to do to find their path through life. Even today, when they have little control over societal change, people with virtually no voice have to rise to this sort of challenge! And, with varying success, they do. Q: How has writing about history changed your perspective about history? I am impressed more and more by how little people’s hopes have changed and how similar their responses and solutions to their problems are. This I feel is the great gift of historical study: that it offers lessons from which we can learn how to handle our current concerns. Want to find out more about Elizabeth and her writing? 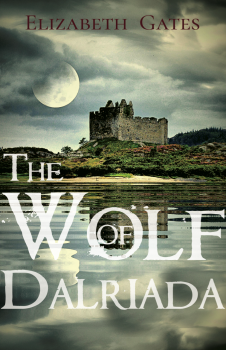 You can also buy The Wolf of Dalriada from Troubador Books and all good bookshops. Available to borrow in the UK and Ireland through Public Libraries. Remember, if you enjoyed this post please share it. If there’s anything else you’d like to ask Elizabeth please leave a comment. Thank you so much for such an interesting experience, Jane. Incidentally, if there are any book club leaders out there who are thinking of adopting ‘The Wolf of Dalriada’, there is a list of suggested Book Club questions on my website.